Almost 500 films ago (!) I watched Ridley Scott’s 1982 film Blade Runner. It was actually my second time watching the movie and apparently, that second viewing gave me, “a new appreciation for the film and its story”. I’m hard pressed to remember what I enjoyed the second time around, but suffice it to say, it’s not winning any awards in my book. It’s decent enough, and I respect the cultural cachet it has, but Blade Runner just fails to connect with me. Blade Runner 2049 is better in many respects, and elucidates what my problems with the original are. For starters, Blade Runner 2049 is just as slow-paced as the original, plodding along from one scene to the next. 2049 brings more mystery and substance to the overall story, but it is just doled out in minuscule morsels, making you beg for something, anything, to keep the story moving. And that’s the first difference I’ll call out, where I think 2049 does better than Blade Runner: there’s a much clearer story arc from beginning to end. K (Ryan Gosling) is trying to hunt down this mystery child replicant to prevent a war from breaking out between humans and replicants. 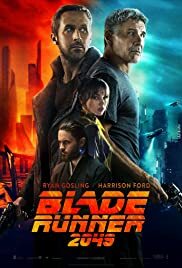 Sounds similar to the premise of Blade Runner where Deckard (Harrison Ford) tracks down four replicants to retire them, but 2049 requires more participation from the audience. As I said in my old review, I walked away from Blade Runner amazed almost entirely by the visuals. Blade Runner 2049 has a much clearer story for me to grab on to, and the twists and turns keep me infinitely more invested with what is going on with K’s adventures than I was with Deckard’s adventures. I’m almost positive there are many nuances that flew wayyy over my head in Blade Runner, but since I don’t know what they are — even after reading articles and listening to people talk about the film — I’m fine with chalking that up to I’m too dumb to understand. Despite being relatively more “mainstream” (i.e. an easier story to understand) doesn’t mean it’s instantly digestible. And my personal reaction is the reason has to do with the aforementioned snails-pace this movie runs on. A common complaint I had heard was Blade Runner 2049 can be a bit long, but I naively thought that even at two hours and forty-nine minutes it’d be a breeze to get through; nope! By the end of the first scene, I knew I was in for a repeat of Blade Runner and by about an hour in I was silently wishing that the film could be subtly played at like 1.2x speed (not actually, I would find it blasphemous to play a movie at anything besides the 1x intended speed, but I was just looking to get on with it). As can often seem to happen in my more negative reviews, I find my words ended up a bit harsher than my overall feeling/rating implies. I did enjoy Blade Runner 2049. The visuals by Roger Deakins (winning his first Oscar for Best Cinematography) were incredible, the story left my guessing, surprised, and engaged throughout (despite the slowness leading to some problems), and Gosling’s performance hit the target a bit better than I remember Harrison Ford’s portrayal of Deckard being in the 1982 film. Gosling had a bit more life and character to him, while also nailing the emotionless facade that a replicant would have. Since I’m not sure what fans of Blade Runner found most appealing about the original, I’m not sure as a whole whether Blade Runner 2049 would be seen as a positive or negative in their eyes. For me, as not-a-fan of the original, I found Blade Runner 2049 to drag on like the original did, but also found it brought some freshness to it that made it more appealing to watch.